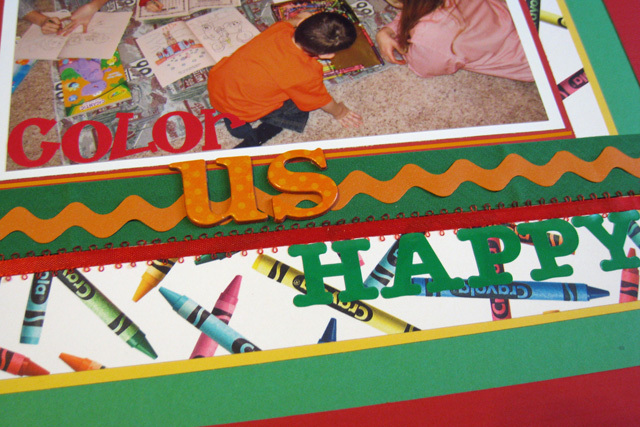 I've been busy completing my i.scrap album, so I just have one additional green layout for this month. 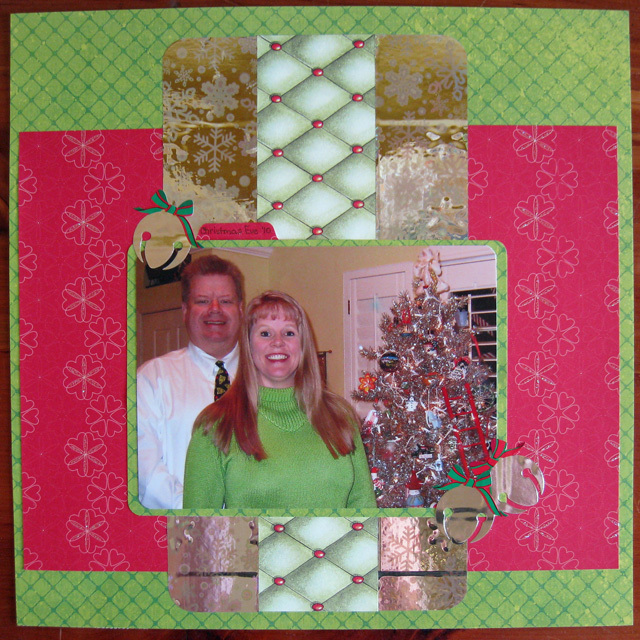 You can see my other green layouts here. 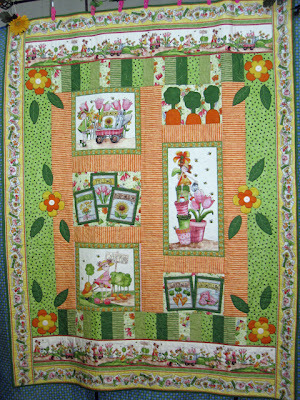 And don't forget to check out Brenda's green quilting projects here. This layout was created in response to the March 17 LOM Community Challenge to "create a Storage Binder layout that combines a photo of someone in your immediate family with a handful of square-punched pictures, from the Square-punched Picture Drawers. 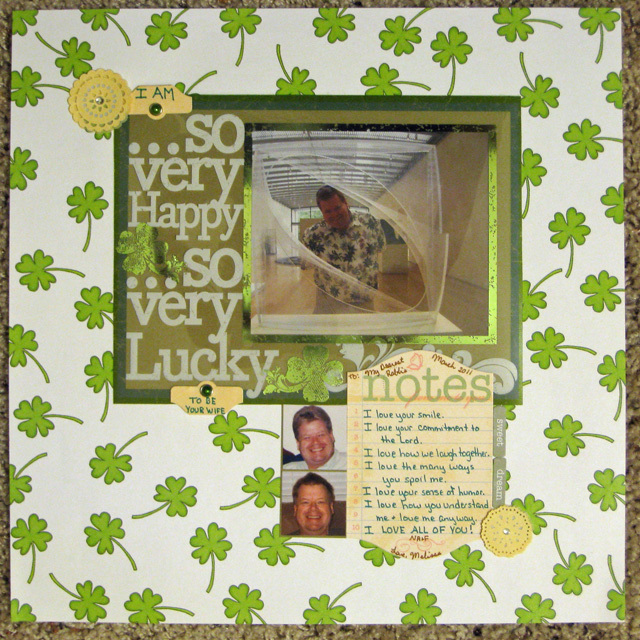 Title this page "Lucky to be You!" and list several things that make this person special." I started with a printed overlay, then added to it to make my title "I am . . . so very happy . . . so very lucky to be your wife." I'm enjoying the fresh green in our world - I mowed the grass this morning while Robbie trimmed and did the weedeating. It's definitely spring time here. Hope you are enjoying some green in your corner of the world today. 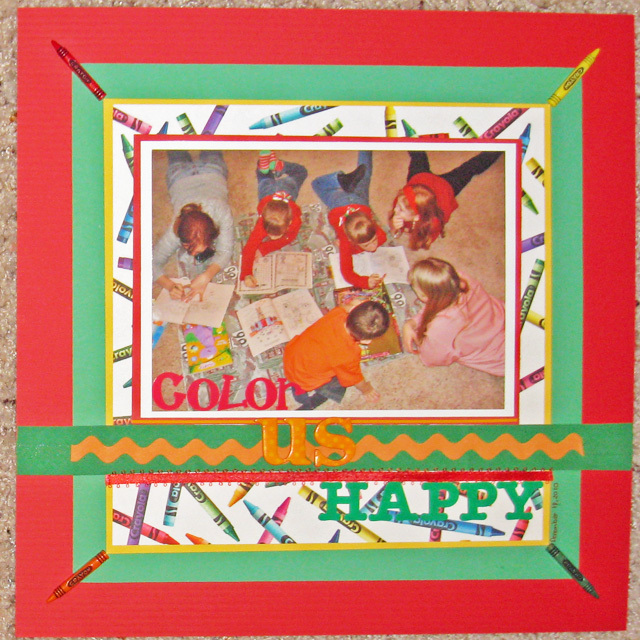 This week I completed my album for the BPC i.scrap workshop taught by Stacy Julian. The album is designed to be an introspective look back at 2010. The workshop was only two weeks long: the first week was devoted to assembling our pages (you can see mine here) and the second week was devoted to journaling. The journaling assignments took me a little longer and then I had to find time to add the handwritten journaling to my pages. I am so excited to have this album completed (and less than ten days after class ended). I truly enjoyed this look back at last year and love that I have recorded these reflections. I'm trying something new today! Stacy shared her completed album with us on the last day of class with a slideshow presentation showing her completed pages as she read her journaling. This is my first time to post a presentation here and I must say that it is not professional quality, however I am excited to share my look back at 2010 with you. 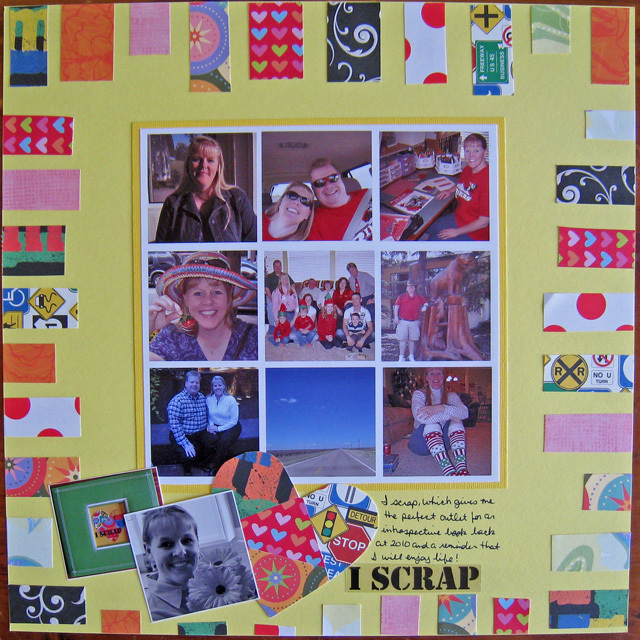 I also created a layout about my i.scrap album - this layout will go in our All About Us LOM album. 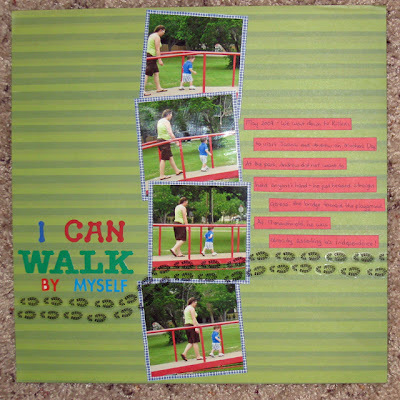 I used scraps from the various patterned papers I used in my album and a collage of the photos I chose for my "I" statements. I finished a few books this past week, and as I was preparing these short book reviews I laughed at the diversity in them. The first is a classic filled with adventures and a fantasy world, the second is popular fiction built around a love story, and the third is spiritual non-fiction.﻿ There just might be something for everyone here. The Hobbit by J.R.R. Tolkien is a classic and a favorite of mine. I've read it before, but since the filming of The Hobbit movie began this month, I decided it was time for another read through. 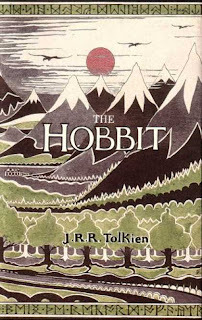 This book chronicles the adventures of Bilbo Baggins as he travels (somewhat reluctantly) with a group of dwarves and (part of the time) Gandalf the Wizard. Their destination is the Lonely Mountain where a dragon lives with all the gold and treasures he obtained from his raid against the dwarves years ago. I enjoy the world that Tolkien created in Middle Earth and all the adventures and travails throughout the journey from the Shire to the Lonely Mountain. One of my favorite scenes occurs when Gandalf continues to talk and negotiate with the trolls until the sun comes over the horizon and the trolls are all turned to stone. (These same stone trolls reappear in Frodo's adventures in The Lord of the Rings trilogy.) Another favorite is at the end of the book when Bilbo returns home on the day of the estate sale (of his estate!) because he was presumed dead. 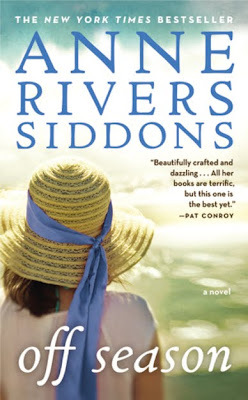 I always enjoy Anne Rivers Siddons' books because she does a fabulous job of creating intriguing indepth characters. The main character in her new book Off Season is Lilly, a recent widow who is grieving the death of her husband while retelling the story of her childhood, the tragic loss of her first love, her relationship with her mother who she lost to cancer as an adolescent, the overly protective relationship she and her father developed throughout her teens years, and the total love she and Cam shared in decades of marriage. True to form, Siddons includes several plot twists along the way. I enjoyed the book until the last chapter, which ended rather abruptly and without wrapping up all the loose ends. It left me wondering what truly happened as there were several scenarios that are possibilities. I know some readers like those types of endings, but I prefer it to wrap up nice and neat so I can move on to the next story. 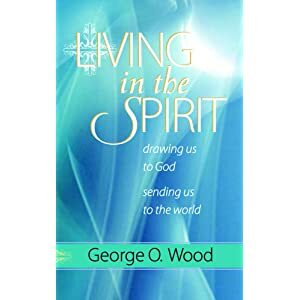 I read Living in the Spirit by George O. Wood as part of the Wednesday night class we are attending at church. This is an excellent book on the working of the Holy Spirit in our lives and has been the catalyst for some great discussion each Wednesday. I'm currently about halfway through two other books, both recommended by Sian, and just starting another that Stacy Julian recommended on a Paperclipping Roundtable episode. Robbie and I are also listening to an audio book in the car and will probably finish it up next week when we're out and about. I hope you're enjoying a good read (or two) this week. Kim, please email me at robbieandmelissa(at)sbcglobal(dot)net so I can get your package to you. Thanks so much to everyone who played along and helped make my blogiversary wonderful! 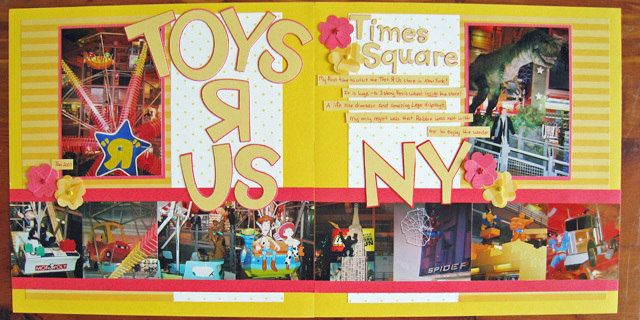 Several years ago, I had to make a quick business trip to New York and discovered for the first time the Toys R Us store in Times Square. The photos from that trip have been in my 2007 storage binder for a while, and I decided this week would be the perfect time to create a layout. I used the One Page Sketch #4 from Sketch Support for this layout. I rotated the sketch and then created a second page as well. 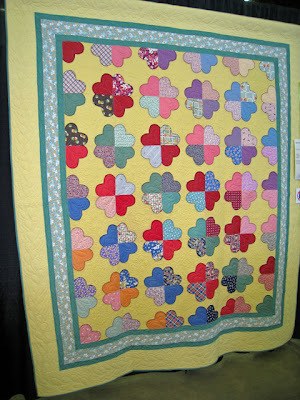 I was inspired to create the heart flower embellishments by Tammy's Flower Tutorial post. Several times I've seen scrappers using a heart punch to create flowers and have been meaning to give it try. 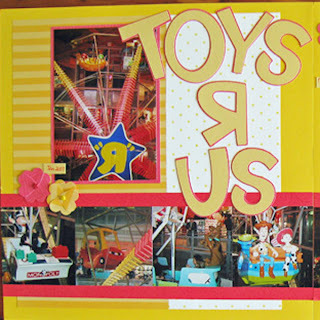 I had printed one of Tammy's photos and put the printout and my heart punch on my craft table so I could try this technique on my next layout, which turned out to be this one about Toys R Us. 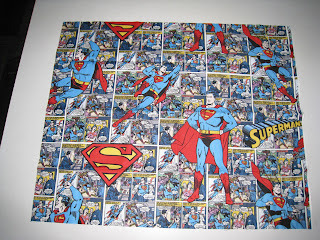 I really like how easy these were to create with leftover scraps of my patterned papers. Journaling reads: My first time to visit the Toys R Us store in New York! It is huge - a 3 story Ferris wheel inside the store! A life size dinosaur and amazing Lego displays. My only regret was that Robbie was not with me to enjoy the wonder. Now for those of you who are feeling sorry for Robbie right now (he is the toy/trading card/game collector of the family after all! 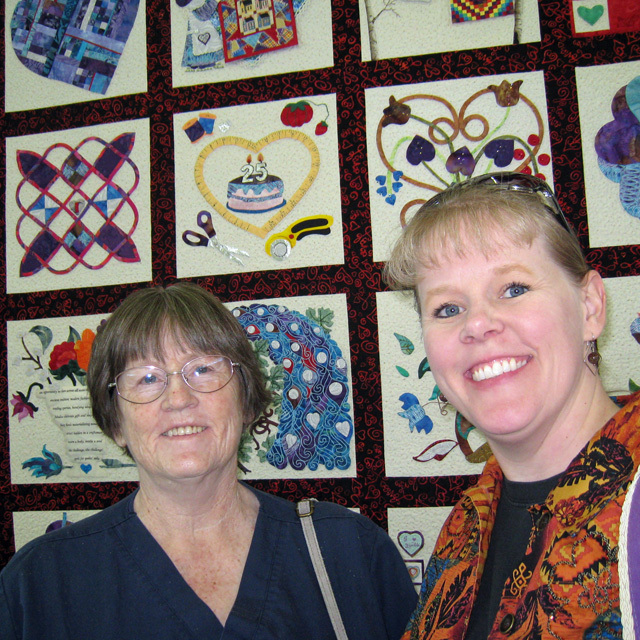 ), we traveled to New York later that year and were able to enjoy the store together. Since then we've visited toy stores around the world. 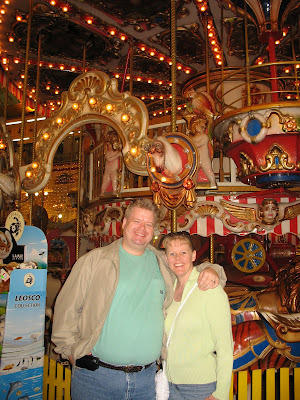 Here we are in front of the carousel inside the largest toy store in Moscow, Russia, aptly named The Children's World. 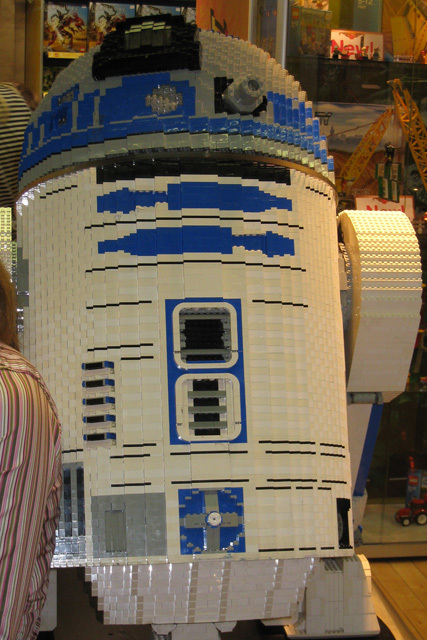 And it never fails to amaze me what can be made out of Legos, like this R2D2 I saw at Hamley's in London. 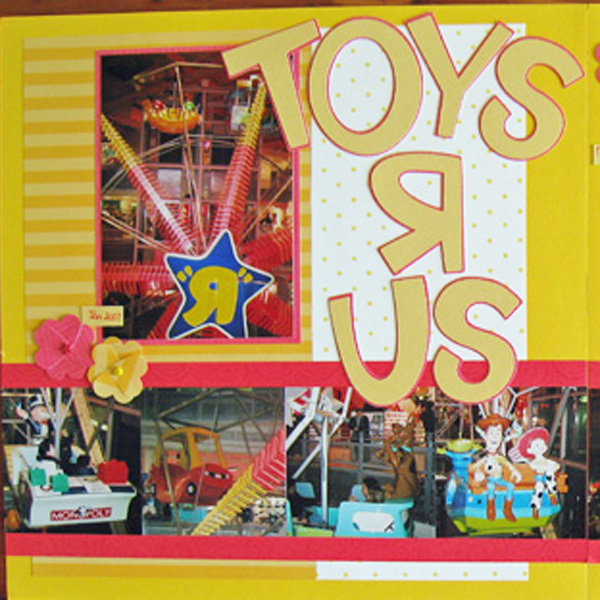 If you have a favorite toy store, please share it with me in the comments! Do you have any favorite shops or sites that you frequent when you're away from home?Where do you like to stop when you're traveling? I continue to be amazed at the friendships and connections I've made through the past year. It totally makes my day to receive encouraging and supportive comments. I really like how commenting on each other's blogs is like an ongoing conversation and we learn about each other and build friendships throughout the blogosphere and around the world. Words on the screen cannot adequately express how much I appreciate each of you who visit regularly or stop by on occasion. 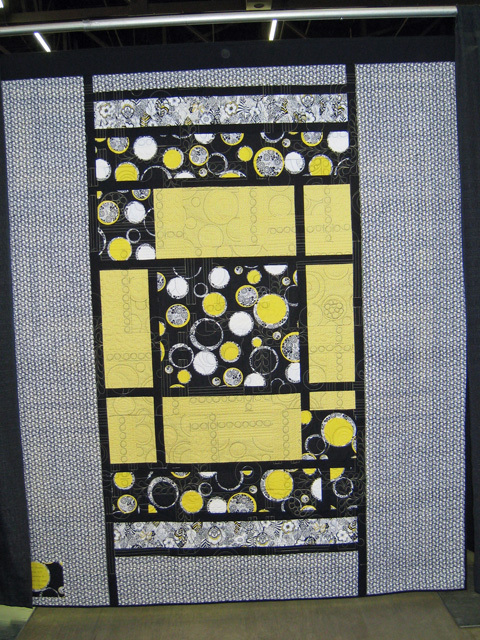 In celebration of my blogiversary, I have a giveaway today. This past weekend I finally finished my PIFs (that I'd hoped to have sent out by the end of February!) 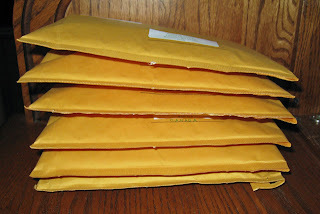 and have them all packaged and ready to mail. 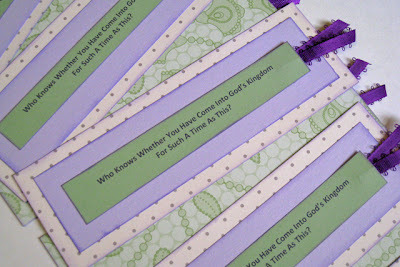 I so enjoyed making these gifts that I created an extra gift for one of today's lucky commenters. 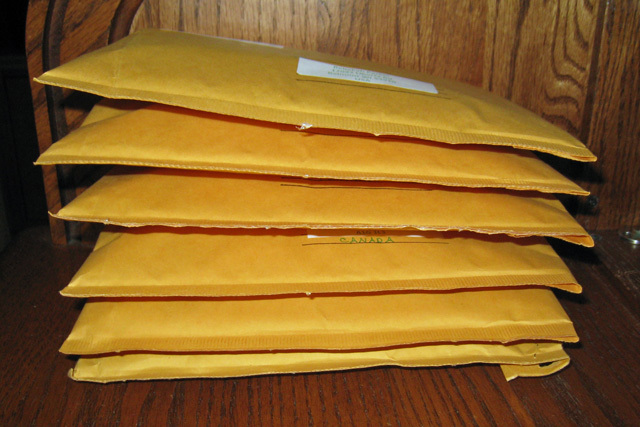 ﻿All of these packages are addressed except one . . . which will go to today's randomly selected winner. Everyone who comments on today's post by noon (CST) on Wednesday, March 23, will be eligible for this giveaway in celebration of my one year blogiversary. If you've been stopping by and not commenting, I'd love to hear from your today. 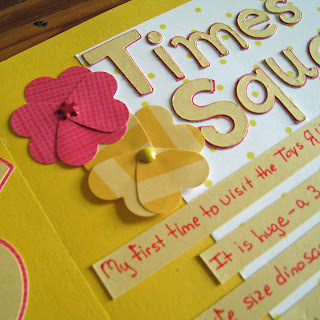 If this is your first visit as part of the Blogging for Scrapbookers class, welcome to my corner of the blogosphere! I truly appreciate each of you allowing me to be a part of your day! 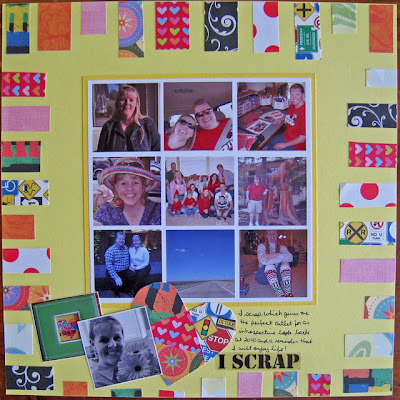 Today is the first day of a new 3-week run of Shimelle's Blogging for Scrapbookers online class. I missed the initial live run of this class in the fall of 2009, however I was able to purchase the class and work through it self-paced when I started my blog last spring. The basic premise of the class is that scrapbooking and blogging are not all that different. It's not too late to sign up! You can read Shimelle's ten reasons to join in and sign up here. 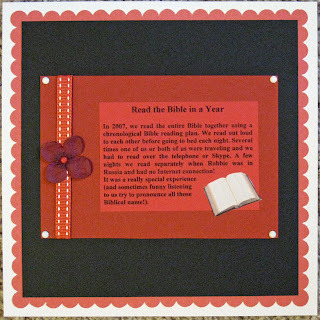 Shimelle will be providing daily prompts for our blogging and/or scrapbooking. Since I've already worked through some of the prompts, I'll be following along and occasionally including a post based on one of the prompts. Each prompt offers several options for completing that day's "assignment". Prompt one encourages us to think about our intentions for the class, to take a photo of our computer/desk area, and/or to scrap a layout about our intentions for the class. I created a layout last year about blogging - you can see it here. And here's a photo I took in September that shows my blog and my calendar (the thing that truly keeps me organized!). 1. Look for ways to improve my blog posts. 2. Gather ideas for future blog posts. 3. "Meet" other bloggers and add a few new blogs to my reader. 4. Enjoy the interaction among bloggers on the forum. 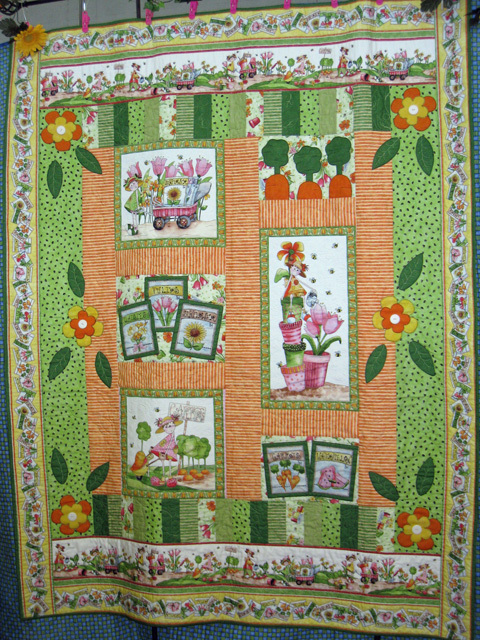 This month's color in Brenda's quilting scrap challenge group is green, so this week I've dug out some green papers, green scraps, and green letter stickers to use on my layouts. I Can Walk By Myself - I created this first layout using a Sketchy Thursdays four photo sketch. I love these photos of my great-nephew asserting his independence by not wanting to hold anyone's hand while he walks across this short bridge to the playground. Christmas Eve 2010 - I had a 5x7 printed of this photo and saw a single photo sketch on the Scrapbooks etc blog earlier this week that I thought was perfect for it. I created a December Daily album that records the events of each day in December, so I only included a small title on this layout and no journaling. I really like the way these papers all work together with the photo. 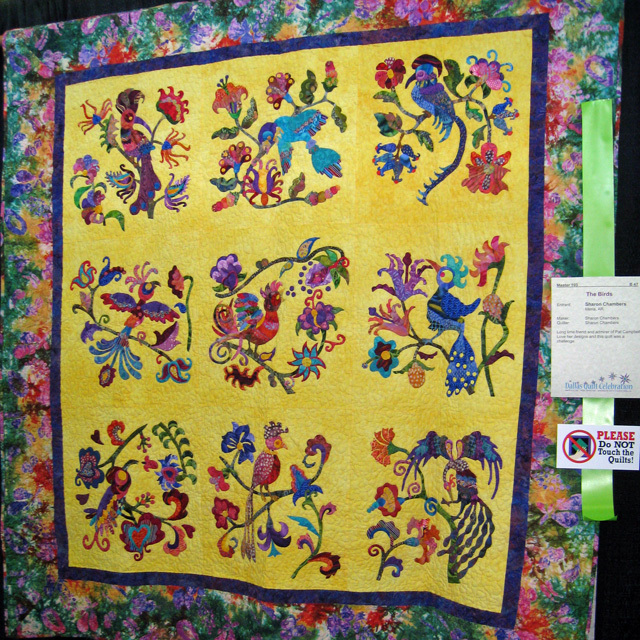 Last Friday, Mama and I spent three hours strolling through a quilt show - the Dallas Quilt Celebration 2011 at Dallas Market Hall. 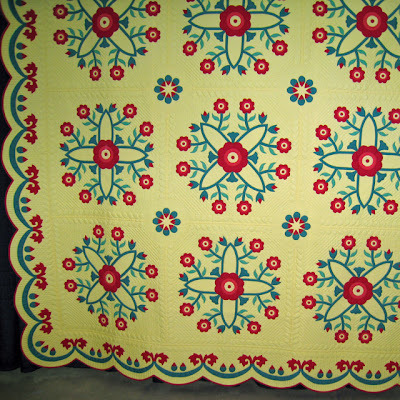 As most of you know, I don't quilt, in fact, I don't even sew. 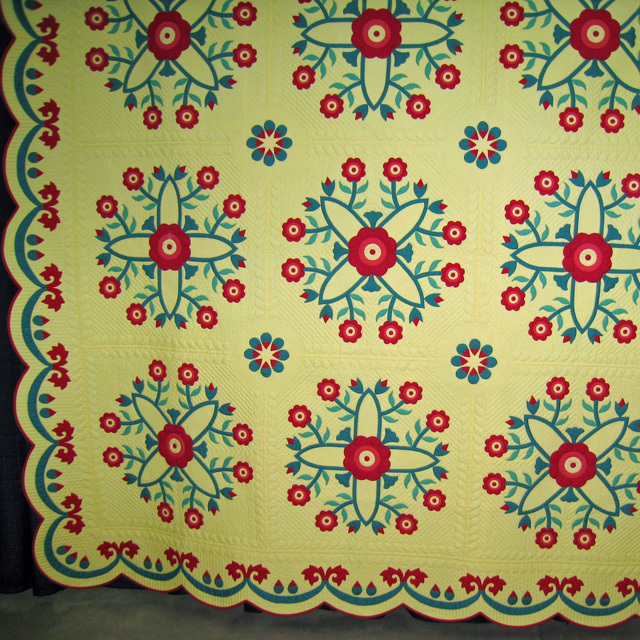 However, since I am the proud owner of many handmade quilts, I believe it is important for me to encourage Mama in her quilt making hobby. There were lots of vendor booths to look through as well, and I picked up a couple of gifts plus a few new items for my scrapbooking stash. 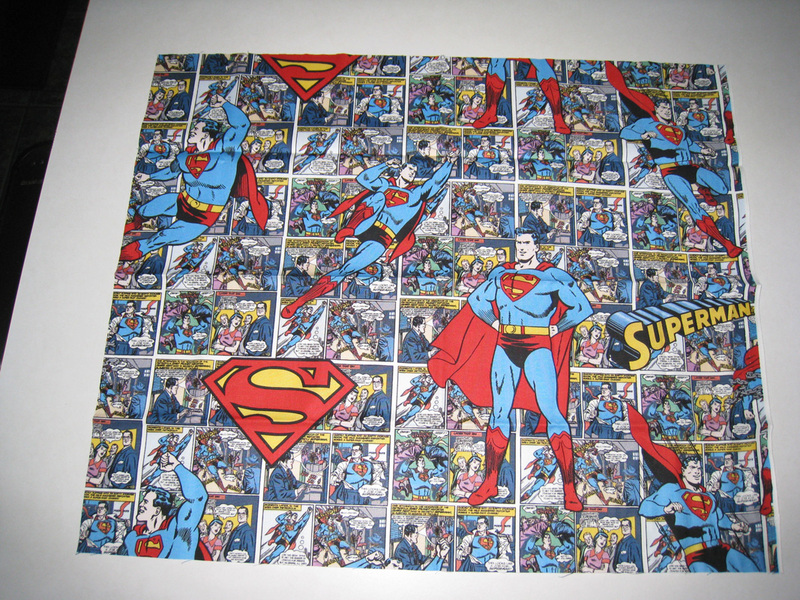 First, I found this wonderful piece of Superman fabric. And then I discovered a booth full of buttons! (You may have already noticed these crayola buttons on my Color Us Happy layout.) 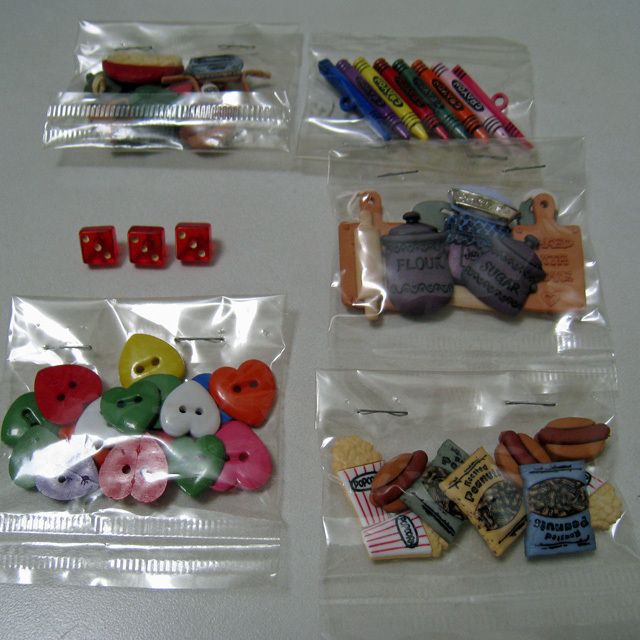 The three red dice buttons are actually vintage buttons that I'm planning to use on my Games We Play mini-album. Overall, it was a fun Friday spent with Mama. I'm off now to scrap a few layouts this afternoon. This week's topic in the Finding Your Way workshop at BPC is Photos. Karen Grunberg encourages us to evaluate the size photos we most like to scrap and the number of photos we like on a layout. 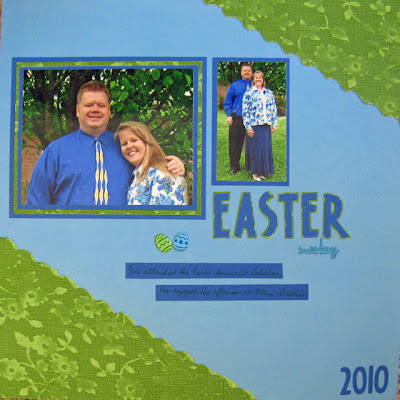 She suggests trying various photo sizes and various number of photos (including no photo) as we scrapbook. Here are a couple of layouts I've created over the past week. This first layout is 8x8 and does not contain a photo. I had created the 4x6 card to include in my 2007 photo album right about the time I began switching over to the LOM system and non-chronological scrapbooking, so this 4x6 card was in my storage binder. This layout will go in our All About Us LOM album. 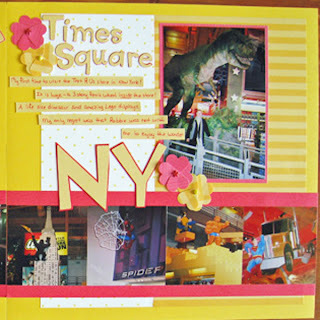 This next layout is 12x12 and showcases one 5x7 photo. I love this photo of my nieces and great-nephew laying on the living room floor coloring during our Christmas get-together last year and knew I would want to highlight it by itself on a layout. So, when I ordered my 4x6 photos from December, I ordered a larger print of this one. This layout will go in our Activities We Enjoy LOM album. I actually scraplifted the title for this layout from a layout by S and I've had this crayola paper in my stash for quite a few years. 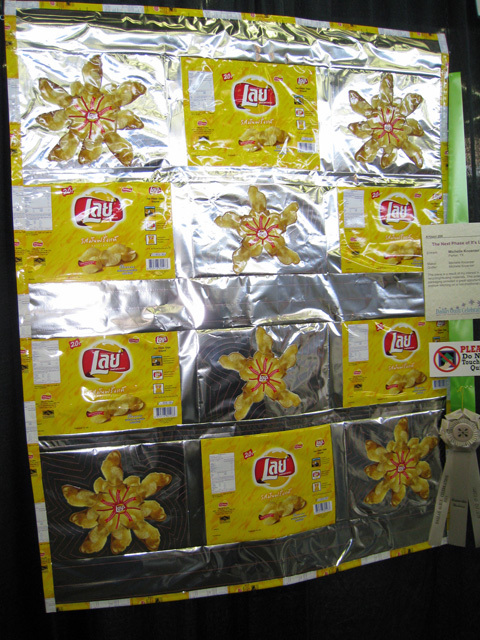 For me, the number of photos on a layout depends on the event or topic of the layout. I have layouts that include numerous photos and some that include one or none and I like them all. I don't think I'll ever settle on one particular type of layout based on the number of photos. BTW - this is my 250th blog post!! 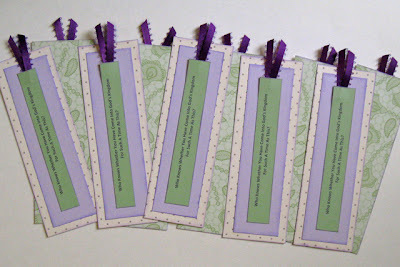 Next week I'll be celebrating my 1st Blogiversary, so be sure to check back for a fun give-away. This past week was the last meeting for the Bible Study I was leading on the book of Esther. After two years of not teaching or leading, I have to admit that I truly enjoyed getting back into studying, preparing, and teaching each week. We concluded the last session of our study by reviewing (and implementing) four parts of the Feast of Purim. 1. Feasting - we went to eat at Cheesecake Factory after the meeting! 2. Joy - we acknowledged the joy of the Lord in our lives. 3. Presents - I presented each of the ladies with a bookmark. 4. Gifts to the Poor - we collected funds to buy Bibles for women in villages in Kenya, Africa. My goal each week was to take the material we studied and apply it to our lives by asking the ladies to ponder a question. I've listed the four questions we've been considering below. I hope you'll take a moment to ponder them today also. 1. Are we so assimilated into our culture that others won't recognize us as Christians? 2. Are we in our current "place" for such a time as this? 3. Is God asking us to trust Him and step out in faith? 4. Are we allowing one bad/negative/frustrating thing in our lives to overshadow all the good things? Sarah Palin's second book, America by Heart: Reflections on Family, Faith, and Flag , included her views on America and the fact that, while our new administration continues to stress change is needed, she believes a return to the beliefs of our founding fathers is necessary to maintain the greatness of America. She stresses American exceptionalism and encourges everyone to read through our Constitution & Declaration of Independence. I enjoyed the book as it is written in the no nonsense style that Sarah Palin is known for in her speaking and writing. I also like that she is pro-America, pro-family, pro-life, and pro-God. 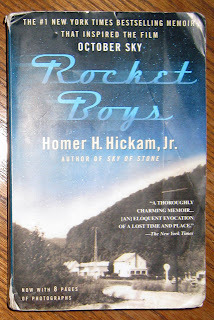 Rocket Boys by Homer H. Hickam, Jr. was this month's Noontime Pageturners book club read. This non-fiction book is the author's memoir of life in a West Virginia coal mining town in the late 1950s and early 1960s. I thoroughly enjoyed the book and think it has appeal for many different readers because it covered life in a small town, family life, coal mining families, the political climate of the times, and most importantly the beginning of the space race. Homer and his friends decide to build rockets so they can go to Cape Canaveral and help America in the quest to prove that Russians are not smarter than Americans. It's a well-written memoir that reads like fiction. While we were strolling through our local Borders bookstore a few weeks ago, I noticed a young author at the book signing table. 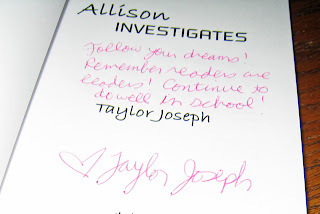 The author was sixteen-year-old Taylor Joseph who was promoting her third book, Allison Investigates . I love the idea of encouraging young people to read and write, so, of course, I had to buy a signed book. 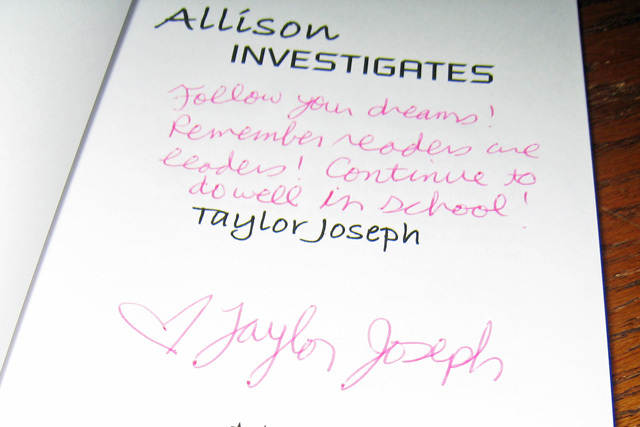 I knew I would probably send this one on to Natashia after reading it, and Taylor signed it with her in mind. 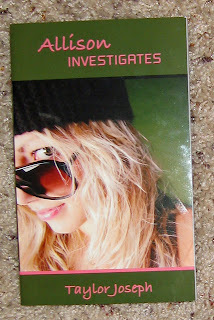 This is a young adult book about four high school students who take it upon themselves to investigate some recent car thefts in their neighborhood. I enjoyed the book and thought it was well written. Near the end of the book, the teenagers get themselves into a very dangerous situation. While it was clear that the situation was dangerous, I don't think the consequences (or lack thereof) fit the severity of the incident. Otherwise I thought it a good read and have passed it on to Natashia. She called a few days ago to say the book had arrived, so I'm hoping she'll share her opinion of it once she's had time to read it. I'm in the process of reading four books right now (listed in my side bar), but should be finishing a couple of those up this week. I hope you are enjoying a good book (or two or three) this weekend.